The Malaya-Borneo Exhibition was an exhibition of the trade and economic possibilities of British Malaya and British Borneo which was arranged to synchronise with His Royal Highness the Prince of Wales's visit to Singapore in March 1922. Governor Sir Lawrence Guillemard conceived the idea of bringing people together from the Malaya peninsula and Borneo for the purpose of enhancing trade and other mutual benefits. "It was also felt that the opportunity was a fitting one for the exhibition, by the commercial and foreign communities, of imported goods in illustration of the varied trade activities of this country in general, and of the great exchange port of Singapore in particular." The Straits Budget described the details of the Planning and Layout of the site situated on reclaimed land adjacent to the Telok Ayer Basin in Singapore. 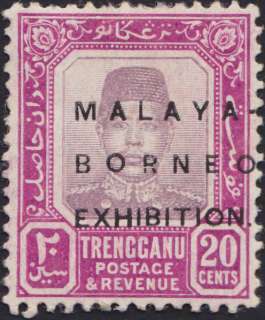 "The large scale on which the Malaya-Borneo Exhibition, which is to be held in April has been arranged, as regards the variety of the exhibits, and the collecting together of arts and crafts, industries with trades of all nationalities, is of necessity occasioning a great deal of work on the part of those engaged in the planning and lay-out of the site in Robinson Road. The area of the site is 65 acres. It extends from Telok Ayer Market to Mount Palmer, a distance of 900 yards. The width, to be covered by the exhibition between Anson Road and the sea is 530 yards and between the main entrance opposite McCallum Street and the sea is 270 yards. These dimensions are on an equality with the dimensions of international exhibitions. Although much of the Ground appeared open and easy for free planning, in actuality there were many deciding and limiting factors. For example, the massive concrete flooring which had been used for the Goliath cranes and the making of caissons for the reclamation work, is an immovable fixture, altogether 900 feet in length and 65 feet in width. This has been utilised for large exhibition plots, the buildings on which will form one side of the main avenue. Then again, a groan of concrete cylinders have been turned to advantage for they have been surrounded with granite stones and filled up with earth and are now in process of being converted into a picturesque rock garden. The overprints were done in a hurry due to the short time scales. The exhibition was opened for 17 days between the 31st of March and the 17th of April 1922. It was intended that the stamps would be available for sale during the event. HRH Prince of Wales, Prince Edward at the opening of MBE 1922. Lead tickets for the exhibition.